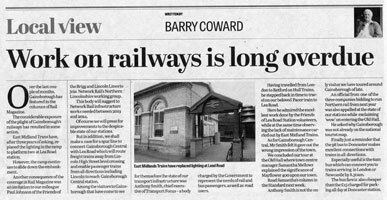 When it comes to publicising bus and rail services, local campaigners often find truth in the saying: "If you want a job done well, do it yourself". We talked to Barry Coward from GraB, a Lincolnshire group which does just that. As well as successfully campaigning for improved services, GRaB (Gainsborough and District Rail and Bus Users Group) has a knack for publicity. From leaflets to poster boards to street signs, GRaB has found many ways to publicise local bus and rail services. But shouldn't this be the operators' responsibility? We asked Barry. "Although Stagecoach buses supply us with copious quantities of timetable leaflets the same cannot be said of our train operating companies," says Barry. "For example Northern Rail have just supplied a timetable leaflet for us to distribute, but they've strictly limited the number available to 200. We can easily hand out 3,000 of the alternative timetable leaflets that we've made ourselves." Barry talked us through some of GraB's most effective publicity tools. 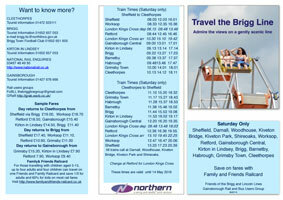 The leaflets produced by GRaB [right] double as a train timetable and a tourist guide [see a full-sized version]. "Print guides to the places served by the line or route and distribute them widely," says Barry. "We have volunteers who distribute our leaflets in libraries, council offices, pubs, shops and bus and rail stations." To produce its publicity materials, GRaB relies on a range of funding sources: "Crowd funding, grants from councils and donations from operators." 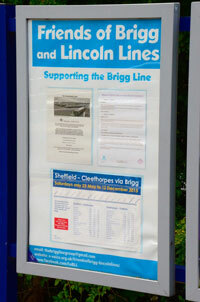 "For the Brigg Line (a Saturday-only service between Sheffield and Cleethorpes via Gainsborough and Brigg) we have secured poster sites [right] to display timetables at all of the stations along the line and at important remote sites such as Leeds, York and Doncaster. Of course it's vital to keep this information up to date." Initiatives like this are only possible if you have a good relationship with operators and councils: "Our secret is that working in partnership produces results." And those results are impressive: "Since we started the Brigg Line campaign in 2013 traffic on the line has grown by 30% each year." In December 2015 shiny new pedestrian signs [left] appeared across the town to direct visitors to the town's two train stations. (The last signage for Gainsborough Central Station was removed in 1983 and never replaced!) How did the group achieve this? "We asked our friendly County Council Highways Engineer. Of course he told us there was no budget available, but he always manages to meet our requests somehow… even if we have to wait two years!" "We have a column in the local paper available to us [right] [see a full-sized version] and make frequent appearances on local radio and television. Always be positive when communicating with the media." GRaB has secured support from influential journalists by taking them on a tour of Gainsborough – a set route that contrasts the poor state of the town's stations with impressive attractions such as the Old Hall, dating from 1480. "This has bags of wow factor and ensures they remember their visit to us."